Robbinsville NC Lake Santeetlah Lake Front Lot for Sale. North Carolina. Santeela. 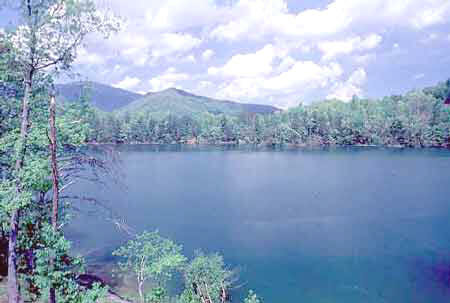 Lakefront lot for sale Robbinsville, Graham County NC. Mountain and Lake view land, building lots, home sites on, near, close to Lake Santeetlah, Santeetla, Santeela and Lake Fontana for sale. Western North Carolina Mountain high elevation acres, acers, acreage, acerage for sale. NC mountain properties joining, adjoining, abutt, next to United States US, U.S. Forest Service National Forest Park land USFS, U.S.F.S and Smoky Mountain National Park land. NC mountain land for sale. Acreage, lots, tracts, waterfront lots, lake front lots, trout stream, creekfront, creekside tracts and gated community, subdivision golf course homesite, sight, lots in the North Carolina Smoky, Smokey, Smokies Mountains. Robbinsville NC Lake Santeetlah Lake Front Lot for Sale. 226 - Lot on Beautiful Lake Santeetlah - 0.35 +/- acre lot on lakefront Santeetlah. Extra large lot with easy access off Pine Ridge Road. Water hook-up available. $329,000.